With a full car and nine hours of highway ahead of us, we had no business braking for farm stands. But we did. Pretty soon we were cramming bags of Silver Queen corn into any fissure we could find. The nice farm stand guy at one place talked us into a new variety of melon – something called Candy Orange, a cross between a honeydew and a cantalope. 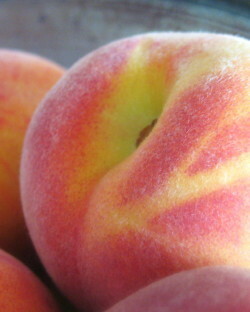 A couple quarts of fresh peaches, a box of blueberries, and a few other fruits later, the car began to smell. Not a bad smell, just a very fragrant, perfumey smell. Roy thought it was rather mango-ish. All I could think about was whether the fruit would make it back without rotting or bruising something terrible. 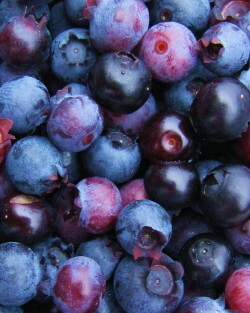 What I like best about farm stand fruit is that most of it is picked ripe or nearly ripe. But that means long car travel is about the worst way to treat these fragile babies. 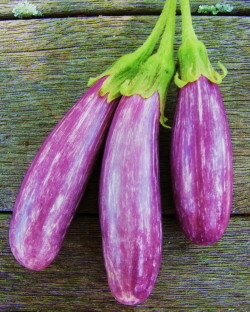 From some other vague part of my brain came the memory of eggplant “fans.” I thought this would be a cool and pretty idea for the little mini eggplants, and so I sliced away. I trimmed the tops of the fruits just enough so that they still hung together, and cut about four parallel lengthwise slices just a bit shy of the tips to make the “fans.” I brushed each slice with olive oil, sprinkled with salt, and lit the grill. Ten minutes later I had lunch. Just three or four minutes on each side was enough to cook these eggplants through (I hate undercooked eggplant). The skin was tender, the flesh soft, and the flavor, well—clean and sweet. Not quite as deep and earthy as a big globe eggplant, but not the least bit bitter or seedy either. I wound up smearing some of my slices with a little extra Humboldt Fog goat cheese our farm-keeping houseguests left in the fridge for us. Wow—that was a killer pairing. 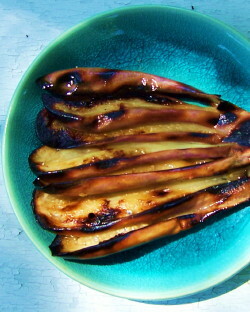 But the grilled eggplant would be great lots of ways: dressed with salsa or a drizzle of chimichurri, in a salad with arugula, fresh mint and a lemony vinaigrette, or just on their own as a cute side, antipasto, or starter. Farm stand finds are fun, huh? P.S. Culinary highlights from the weekend in Delaware included a Fast, Fresh & Green signing at the wonderful Historic Lewes Farmer’s Market, my sister Eleanor’s delicious baby back ribs, and a trip to Hopkins Farm Creamery for cow-fresh ice cream (complete with barnyard smells). We didn’t get a chance to eat crabs, pick beach plums, or pan-fry some scrapple on this trip—next year! P.P.S. My camera has met a sad fate, so I beg your patience while I research a new camera (and rob a bank to pay for it!). I’m glad there was some Humboldt Fog left…thought we’d eaten it all!! Hey Margaret — That was a real treat! I think I may have a tupperware of yours…will get it back to you at some point. Glad you guys had a fun farm dinner. Glad you had fun, but, no crab?!? How is that possible?? Oh, I was in VA over the weekend. I could have driven to your book signing. Drats! Hi Katrina–Well I am so glad you found the blog and that you love the book! 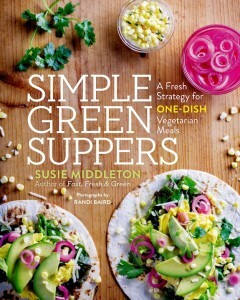 Yes, I do have a new book coming out next spring. 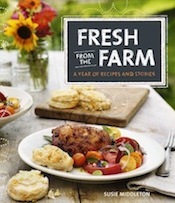 It’s called Fresh & Green for Dinner and it’s a bit of a sequel to the first book, only this time it is all vegetable-centered main dishes (again, for everybody, not just vegetarians) — pasta, pizzas, soups, stews, ragouts, salads…all kinds of fun things. (Chronicle Books, 2012). Thanks for all your nice comments. Oh my gosh, katie, the video is so great! We got some good chuckles out of it of course but loved all the shots and the description of your duties! You didn’t say that you not only kept the animals and the garden alive, but did in fact, bring in the cash with your lovely display of goodies! Yes, that outdoor shower is fabulous (as you would say)…let me know how I can share this video best with my blog readers…a link to your site?